Scott Harding is a Wide Receiver for the University Of Hawaii. Born in Brisbane, Scott graduated in 2004 from Anglican Church Grammar School. He was a member of the AFL National Team at the age of 15. He also played for the QLD State Team for the U16, U17 and U18 teams. Prior to attending the University Of Hawaii, Scott played 6 seasons in the AFL. 5 of them were spent with the Brisbane Lions and 1 with the Port Adelaide Power. He was drafted in 2005 out of a local Brisbane club, Morningside. Scott earned a scholarship to Hawaii in 2011, where he played in 12 games as a slot receiver and returner. He appeared in 12 games in 2012 as a Sophmore, with 8 starts and was the team’s starting punt returner in all 12 games. Scott also played 3 games that year as the punter and the holder. Selected to the Tahoo! Sports Freshmen All-America second team as a punt returner. His Freshman Year (2011) he return 19 punts for 141 yards and a 7.4 average, which ranked third in the WAC. Sean Muir is an offensive lineman who currently plays for the Baylor Bears, a Division I University in the USA. A 2010 graduate of Kirrawee High School in Sydney, Sean did not play competitive football prior to enrolling at Baylor. In parts 1 and 2, we talked about the tailgate party and the pre-game atmosphere. Now it’s game time! The teams have just taken the field from the tunnel and the crowd is going crazy. Get ready for some college football! The culmination of the pre-game festivities and the start of the game itself all happen in one moment with the opening kickoff. You would be hard-pressed to find someone sitting down inside the stadium (and if they were their view would most likely be blocked by everyone else standing around them). Many schools will have some sort of kickoff ritual that will start just before the kicker makes his approach to the ball. Once the kick is in the air the game is officially under way! There are a few great things about being in the stadium during the game. For one, there is the announcer, who is broadcasting from the press box high above the stadium. He is most likely responsible for letting you know what happened during the play, who was involved, and what the down & distance will be for the next play. In between plays there will be music playing, sometimes from the band who is now situated in a section of the stands. As soon as the quarterback breaks the huddle (if there is one), the music will stop. If the home team is on offense, the crowd will also become quiet so that the home team can operate without distraction. If the visiting team is on offense, however, it is a whole different atmosphere, with the crowd making as much noise as possible. This makes it difficult for the team on offense to hear and will produce some negative results from time to time, including the false start, which is the most common penalty caused by the crowd noise. The cheerleaders will be active during the game as well from their position on the sidelines. During key points in the drive, the cheerleaders will lead the fans it chants to support their team. During timeouts and breaks in the action, the cheerleaders will perform routines which feature lifts and stunts and can be quite incredible to watch. The band will also play during time-outs. During this time the dance team might perform routines, usually from the sideline opposite the cheerleaders, or in some cases from the end zone. Between the band, the dance team and the cheerleaders there is plenty of things going on, but that’s not all…. Perhaps the most recognizable person on the sideline is the team mascot. Depending on the school, this could either be a person dressed up as a mascot, a real live animal, or both. The University of Texas Longhorns mascot is “Bevo”, a live Longhorn that stands on the sidelines during the game. You can see more mascots by checking out this article. The atmosphere is electric. People rise and fall during big moments in the game. There are people chanting and cheering and you can literally follow the game without even watching. The sighs, cheers & boos of the crowd tell you how every moment plays out. College gameday is truly a unique experience! We hope that you enjoyed our series and that you got to know the college gameday event from beginning to end. In the previous blog post “College Football: More Than Just A Game – Part 1“, we focused on the Tailgate Party. Now it’s time to enter the stadium and grab your seat for the big game! Don’t forget that everything in college football is an experience! Just like the tailgate party, the pre-game festivities are packed full of excitement and, of course, food and drinks! Just Imagine your walking into the entrance of the stadium. Most likely you are going to enter at one of many ticket entrances that will be closest to your seating section. Someone will take your ticket (or scan your ticket) and then you are inside a college-football “themed” amusement park. As you walk in you will most likely see someone standing nearby selling programs which have details about the game and the home school’s sports programs. This is no ordinary 2 page program you might get at a play or recital, but more like an 80 page magazine filled with stories, pictures and information. Enough information, in fact, that some programs can get pretty pricey. For example, the 2013 BCS National Championship Program was 332 pages long and cost $20 each. That’s enough information to read throughout the entire pre-game, and probably all year until the next championship. So now that you have your program, you might want to check out the nearest merchandise booth to stock up on your team gear for the game. Hopefully you came prepared and bought your shirt before you came, because merchandise inside the stadium can get a bit pricey. But don’t fear, because there are tons of other things you can buy to show support for your team. Everything from hats to noisemakers are available with team colors and logos. Some of today’s merchandise booths more closely resemble a gift shop filled with just about anything you could put a logo on! Your now decked out in gear, and on your way to find your seat. But wait…there’s no point in rushing to sit down until you have gotten something to eat and drink. The menu options at a college football stadium are expanding each year, with all kinds of new things being added including pizza, barbeque and sometimes even steak! [/list] You can be sure that you will find most if not all of these items on the menu, as well as a selection of soft drinks and beer. So now we are in our seat, program in our lap, food in our hands! You probably have done the smart thing and arrived early to your seat so that you can enjoy the pre-game festivities inside the stadium. The teams will spend about an hour going through their warmup routine. Quarterbacks will throw routes to the skill players. Defensive Backs & Linebackers might be doing backpedal and ball drills or tackling. They might also be doing some 7 on 7 drills at this point. Obviously this order can change dramatically depending on the team and the coaching staff, but you get an idea of the time spent and the process by which the teams warm up for the game. During all of this, there will also be music playing and video playing on the jumbo tron. By the time the teams finish warming up, it is time for the marching band to take the field for the pre-game show. In most cases, both teams will bring a band to the game, and both bands will perform. While the band is performing, the cheerleaders for each squad is warming up and doing throws and lifts on the sideline. Each team might also have a dance squad as well, which will most likely be performing to the music of the band, or to the music being played through the speakers inside the stadium. After the band has finished, the home team fans will start doing cheers. Some will be lead by the cheerleaders, but many others will grow organically. Most fans will know all of the cheers and rituals associated with their team beforehand. If you are new, don’t worry, you will pick them up quickly. It could be anything from a cheer to a series of hand gestures to a full on wave! College football is full of tradition and the fans are no exception. If your not sure what I mean…just watch this video of Texas A&M. In recent years, the coin toss will take place before the teams actually come onto the field before the game. The captains from each team will be sent to meet each other and the officials in the middle of the field. The head referee will flip a coin to decide which team will have the decision. Their decision can be to take the ball first, to kick the ball first (in which case they get the ball in the 2nd half), or they can defer, meaning they will let the other team choose and they will instead choose in the 2nd half (which means they will most likely take the ball). Finally, it will be time for the team entrances. This is one of the most exciting and heart-pumping moments of the pre-game. The stadium has filled to capacity and everyone is on their feet as the home team starts to peak their heads out of the entrance. If it is a night game, the lights will go off, the music will start to play and the stadium will fill with electricity. Smoke billows out from the entrance to the field and the highlights are playing on the jumbo tron. Just as you think you can’t take the suspense any longer, the team bursts out of the tunnel and onto the field to the sounds of the fight song and the roar of the crowd. It is one of the most magical experiences in sport! The pre-game is all about building the excitement for the game to come. In part 3 of our series, we will look at the game itself. In a locker room in the US, young men are getting taped up, putting their pads on and getting mentally prepared to take the field. They will compete against talented opponents, many of whom have been playing or following the game of American Football their whole lives. This is the culmination of a lifetime of hard work and dedication, and it’s known in the states as Gameday. In the states, it’s called that because college football is more than just the competition. It is an entire day of fanfare and excitement, of honor and tradition and incredible entertainment. For most players around the globe, the college football gameday is something that you may not have experienced first hand. In conjunction with the Southern Cross All-Stars trip to Hawaii in 2013, we wanted to give you a sneak peak into the gameday experience, from tailgating to pre-game, the game itself and everything in between…from the perspective of the fan. we begin at 8:00 AM on gameday…. In the US, it is commonly known that a tailgate party is a party held in the carpark of college football games. The fans gather hours before the game to BBQ and socialize before the game starts. The tailgate party is more than just a few sausages and hamburgers washed down by a couple of refreshments; it is a tradition. Part ritual, part social gathering and part preparation for the day ahead. The origins of the tailgate party was a few fans camped out on the back of their trucks and cars, sharing food and drinks before entering the stadium. These days it has grown into an all day event, with many people going to elaborate measures to tailgate in style. It is not uncommon for people to bring couches or other furniture and set up big screen TVs and satellite cable to watch other games in progress. Some people even build custom tailgating vehicles decorated from top to bottom in school colors and equipped with gigantic BBQ’s. In fact, many people who tailgate at a college football game today don’t even have a vehicle at all, but instead roam around to various set-ups throughout the parking lots and outside the stadium to enjoy food and drinks and catch up with friends and fellow fans. The BBQ: Most likely it is a gas grill brought in the back of the truck from your backyard. Standard food includes hot dogs, hamburgers and sometimes wings. More elaborate setups will include a huge BBQ smoker where large amounts of meat are slow-cooked throughout the morning and then shared between large groups of tailgaters. The Tent: Almost all tailgating events are concentrated underneath tents (or marquees) that are set up to shade the sun or protect from the weather. Many of these tents are in the team colors, and some even have logos of the team on them. The Beer: We’re not sure how much beer is consumed at a typical Division I college football tailgate party, but you can be sure that there will be plenty of cold cans readily available. There are a minority of fans who provide cocktails such as frozen margaritas or something similar, but you can be assured that the drink of the day is cold beer. Many people will spend the entire morning and afternoon in the parking lot. Some fans who don’t have tickets will stay at the tailgate party and watch the game from a TV. What started out as an underground ritual has grown into a major spectacle at college football games. In fact, ESPN, the US sports network that covers major college games, has a crew that visits one marquee match up each week. They set up an elaborate stage and broadcast center in the parking lot and broadcast a pregame show from the stadium. Many people know this show simply as College Gameday. To truly understand this experience, you have to go and get a taste for yourself. 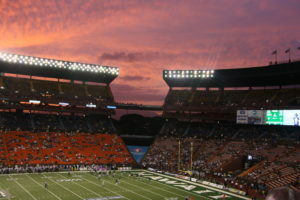 This is why, as part of the Southern Cross All-Stars tour, we attend the Hawaii tailgating party and the UH alumni tailgate party prior to the game. There’s nothing quite like this experience, which has been referred to by many as the “last american neighborhood”, and the “new American community”. Up next in our “More Than Just A Game” series…Part 2: The Pregame. It’s no secret that our nearest US neighbor, Hawaii, shares a lot of similarities with Australia & New Zealand. One of those similarities (for a lucky few of us) is a love of American Football. In conjunction with our 2013 Southern Cross All-Stars trip to Hawaii, The staff at Bring It On Sports thought it was only fitting that we should look back at the people who came before us. Perhaps more Aussies have competed in Division I American Football at the University of Hawaii than any other place on earth! Colin Scotts 1982 (Sydney Australia) – First Aussie to receive a scholarship for American Football in the US. Paul Sironen 1984 (Sydney Australia) – Prominent rugby league player that played for 1 season at UH. Mark Nua 1984 (Auckland New Zealand ) – played for Hawaii and eventually got picked up by the San Diego Chargers. Paul Manera 1989 (Sydney Australia) – Pictured Above – Played in Mississippi and also Hawaii and the director of the Southern Cross All-Stars & Bring It On Sports. Matt Mcbriar 1999 approx (Victoria) – after playing for UH, was signed by the Denver Broncos…also played for the Dallas Cowboys and Philadelphia Eagles as well as other NFL teams. He is currently a Free Agent. Adrian Thomas Sydney Australia (2006) – Now playing Semi-Pro American Football in Germany. Alex Dunnechie (2009) – Punter for UH and has also had workouts with NFL teams including the New York Jets. Scott Harding (2011) (Brisbane Australia) – current UH player. Blake Muir (2011 Sydney Australia) – current UH player. One of the reasons we put on this trip to Hawaii with the Southern Cross All-Stars is to expose a whole new generation to the bond we share with our Rainbow Warrior counterparts. It will be interesting to see how this connection strengthens as we continue to expand and grow the game in Australia & New Zealand. Now that women are playing football across the globe, The Southern Corss All-Stars will be fielding a women’s tackle football team to compete in 2013 along side our men’s team. Bring It On Sports hopes to use this opportunity to grow and expand the women’s game along side the mens. We hope that those of you who get to take part in this year’s Southern Cross All-Stars trip can experience first hand the fanfare and awe of American College Football. Who knows…maybe you will be the next name we add to this list.